Tomorrow it will be eight years since our son Matthew died suddenly from a virulent form of strep that attacked his heart. It has been a journey that continues to unfold before us in ways we never could have imagined. Somehow life has continued to flow, hours turning into days, then into weeks and now into years. We have found that getting away for a couple of weeks in October helps us deal with the memories of the three weeks that occurred preceding Matthew’s death (the various hospitals, ICUs, surgery etc). This year we took a two-week road trip down to Zion National Park, looping back through Yosemite. It was glorious. We spent many hours outside, hiking in some of the most beautiful spots on earth. The natural world defined our days much more than when we are home and working. Being outside in nature helped assuage our grief. 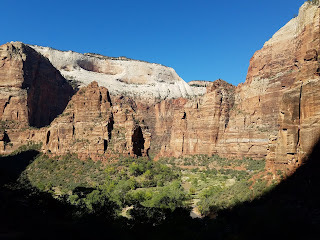 You can't help but feel humbled when looking up at the soaring red rocks of Zion or the glistening peak of El Capitan. We talked a lot about Matthew, not the three weeks in October 2010, but about the 21 years we had with him. There’s an ancient Egyptian proverb that says that “to speak the name of the dead is to make them live again.” So we talk about Matthew a lot. Normally I try and write some sort of anniversary essay that sums up my thoughts at this specific point of time. This year I find my thoughts are more sporadic, less orderly. I’m not sure why, but that's how it is. So here are some random thoughts on what grief has taught me as we sit on the cusp of the 8th anniversary. As that first year passed and then a second year, the path began to seem clearer and easier to navigate. The mud that had been such a slog to get through became hard-packed, and light began to appear. Time began to have a form again and each day didn’t seem interminable. At some point I found that I could smile and even laugh again. I learned that you can laugh even when you are in the midst of the deepest grief. Humor was essential to my survival. (and some of the darkest humor has come from other bereaved moms). The loss of Matthew changed me completely. Grief changed me, changed my family and changed the course of our lives. It’s an irrefutable fact. I think one of the results is that we are more empathetic and aware of the preciousness (and precariousness) of life. We are less likely to get truly upset about the small stuff, because after you lose a child, everything seems like small stuff. You look at the world with softer eyes and gain an appreciation for precious things like a beautiful sunset or crisp autumn leaves. Everything is a little more intense and you find that you seek deeper connections to people and that there's not much room for superficiality. From the beginning, the connections I made with other bereaved moms have been vital to my survival. Some of them were further ahead, some walking in tandem and others just beginning the journey. We form bonds that are instant and strong because no one else can possibly understand what it means to lose a child. I met two women in their 90’s (Rae and Evelyn) who had lost their children 40 and 50 years ago, and when they talked of them, their voices grew softer, their eyes filled with tears and I would look at them and nod. I understood that the pain never goes away. It’s always there, but you somehow manage to integrate the loss into your life so that it becomes a part of you. You learn to carry the memories you have of your child so that you can move forward with grace. At some point, as the loss becomes integrated into your life, you realize that in order to carry on you need to have hope. You need to find meaning again. In the beginning, this seems impossible. But I found as the years went by, that I was able to give new definition to my life. In my case, I started a new job working with the elderly, and also with the bereaved. I feel not only comfortable with them, but like I have an understanding of them, and can BE with them in supportive ways. Life’s milestones (graduations, weddings, births etc.) will always be somewhat bittersweet for us. We will always know that someone is missing from these big events. In the beginning of our journey, we went to graduations. It’s where we were 6,7,8 years ago. Now we go to a lot of weddings. And while we can’t help but wish that we had been able to go to Matthew’s college graduation or Matthew’s wedding, we are also truly honored to participate in the important life events of our dear friends and their children. We can be both joyful (and a little sad) as we learn to navigate life's milestones without Matthew. People who have not experienced the loss of a child might think that after 8 years you are “over it.” They may look at me and see someone who is “all better.” Yes, I laugh, I have fun, I have a job that is meaningful and a loving family. And they might (erroneously) assume that I’ve gotten over the death of Matthew. But I am here to tell you that you never get over the loss of your child. Never. Ever. And why would you want to? We will always have a hole in our hearts and will carry it with us as we move forward. Grief and loss are reminders of how fleeting our time is on earth, and the importance of living. I know firsthand that life is both light and shadows, and that it’s possible to savor and enjoy it, even with the most profound kind of loss. It's pretty remarkable how resilient humans can be. For those that have lost a child, I stand in solidarity with you and wish you love and light as you move forward in life. Robin - I will be writing a book "Conscious Dying—Conscious Grieving: Creating the Change Necessary to Heal" in 2019. With your permission I would like to add your blog to the Resouces area of the book. It's been 5+ years since my 39 y o son died. The paradox is it does get easier and the sorrow will always be there. Thank you for sharing this. I think of you often and am happy to learn more about what your life is like in 2018. Robin, I’m here on Bainbridge, reading and remembering. It was at Blackbirds with Cynti when we met. It is almost 11 years since Sarah died. You speak the truth and gift us all when you write about it. Thank you. Thank you for your insight and beautiful words. I have not lost a child, however others I know have, and your perspective helps me to understand their loss better. I will share this with them, and remember to treasure each day and those who are still in my life. Thank you, Robin, for being a spokesperson for all those families who have been rent through the loss of a child/sibling. You are a gift.